Over the past month I’ve crashed the occasional night on the couch of a friend in Rocinha, as is common among many young foreigners who visit Rio’s favelas not only to research or volunteer, but to socialize. Nothing out of the ordinary, or so it seems. Except, that is, if you ask with whom and where. 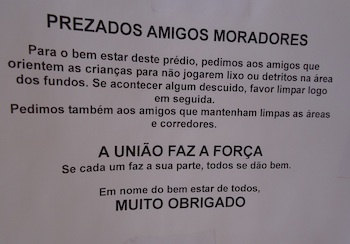 My friend is foreign and the apartment he is sharing with another ‘gringo’ is part of the PAC housing unit in Rocinha. The house where my friends are living is part of the ‘My House, My Life’ program, the goal of which is to “reduce the housing deficit, ensure access to home ownership and improve the quality of life of those living in precarious communities.” It is Brazil’s first large-scale venture into affordable housing following over a century of urban migration. 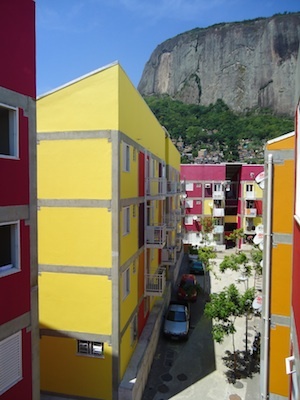 The PAC housing in Rocinha was built along Rua 4, previously known for the highest rates of tuberculosis in all of Rio de Janeiro state. In 2010 PAC came in, tore down many existing houses, broadening the road from 1 to 10 meters to increase air circulation and reduce the tuberculosis rate. Most inhabitants were then moved into one of 144 units in the newly built PAC buildings. 144 minus 1, that is. My friends are subletting their unit from the original PAC house occupant, who now lives with his family in Copacabana. 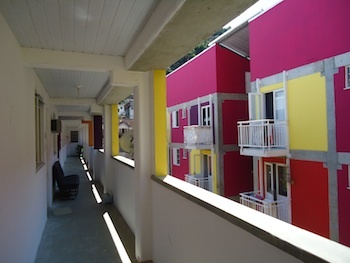 The PAC housing was built to help community residents living on a particularly vulnerable street in Rocinha. Public resources invested to support “precarious segments of society” instead are unwittingly supporting a very different segment. This example is not only important because it shows the misuse (or abuse) of government programs. It also shows how such programs and policies can have larger unintended effects and may ultimately serve to further dis-integrate carioca society. Whereas Brazil has broken dramatically with international trends and national inequality has been on a sharp national decline over the past 11 years, Rio de Janeiro’s Gini coefficient (which measures inequality) remains at .6, comparable with the most unequal societies on Earth. This tradition is apparently set to stay. The PAC houses in Rocinha were inaugurated in 2010, an election year, before the community was pacified last November through the state’s UPP (Pacifying Police Units) program. In 2010 and 2011 they served their intended purpose, providing a rare example of quality public housing in Rio. After the pacification of Rocinha, however, as has occurred in many other communities, a new sense of safety resulted in a dramatic increase in land value and thus rent prices. In Rocinha, for example, a favela with more than 100,000 inhabitants, 35% are renters. Three days after pacification O Globo reported that house prices were up 50%. How will those 35,000 people pay the increased rent? Gentrification has already established itself as one of the most detrimental side effects of UPP policy. Gentrification occurs when a new social development, intentionally or unintentionally improving conditions in an underdeveloped or working class area, lead it to become more desirable and thus more expensive. In Rocinha prices have risen to such an extent that some of the original, and poorer, residents are moving out. Their places are taken up by people from a different (and higher) social class, or by tourists and foreign volunteers, who can afford the new prices. This process in Rio is of particular concern because it is a wide range of costly government policies theoretically designed to “benefit the poor” that are triggering this process. The lowest income residents of these centrally located favelas are pushed to more distant communities where they must build life anew with much reduced access to opportunity. The stated intention of the UPP policy is to “recover territories that had been lost to the drug traffic and bring social inclusion to the most needy portion of the population,” but the perceived intention across society and effective outcome is to increase the sense of safety in the city for the 2014 and 2016 sports events. Gentrification plays into these goals by raising the image of security and the “attractiveness” of the favela. The gentrification process thus serves the “security goals” of the government. My friend’s move to Rocinha may not seem like a problem. It may even look like a good thing, because the family, who is renting out their PAC residence, has been able to increase their income and move to the middle class neighborhood of Copacabana, while freeing up space for people who live in less desirable places to move to the PAC houses. Yet when government habitation, meant to shelter the precarious segments of the population, are rented by outsiders from higher classes, this internal process of upward social movement is effectively halted. Instead of allowing people within the community to move into better accommodations, which also allow for improvement of their social and economic situation, these places are taken up by foreigners and other outsiders who drive up prices and thus drive out locals. Some argue that more foreigners and people from higher social classes will improve the general living conditions in the favela, that they will generate improved consumer services, higher tax bases, and the beneficial effects of middle class vigilance over municipal services. Yet how does this benefit those who have to move out of the community? The most vulnerable residents of the favelas are the ones that will lose out—exactly the intended beneficiaries of government programs like PAC and UPP. This article was written by Corinne Cath, and published on March 23, 2012.